Built, as was the Elian bridge in front, by the Emperor Hadrian (117-138) as a Mausoleum for himself and his successors, it was completed by Antoninus Pius in 139. 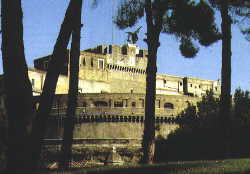 In 271, the Emperor Aurelian incorporated the pile into the defence system he designed: it lost its function as a tomb to become a fortress. In 1277 it was occupied by Nicholas II who connected it to the Vatican by the famous corridor, a safety passage which runs along the top of the encircling wall of the Vatican. Hencefort, it remained under the control of the Popes who used it as a fortress, to impress, but also as a prison and a place for torture. Floor I from which starts the famous winding ramp about 400 feet long, a stupendous Roman costruction. Floor II (or floor of the prisons) with horrible cells, called "historical" prisons, and store-rooms for wheat and oil. Floor III (or military floor) with two big courtyards. Floor IV (or papal floor) with the loggia of Julius II, by Bramante, in the principal part of the Castle and the papal apartment, consisting of magnificent rooms with frescoes by Giulio Romano, Perin del Vaga and others painters of Raphael's school, the Sala del Tesoro and Cagliostro's Room, the prison cell of the famous alchemist of the 18th century. Floor V (top floor) with a big terrace, dominated by an Archangel in bronze by Wersschaffelt, from which we have a fine panorama of the city.